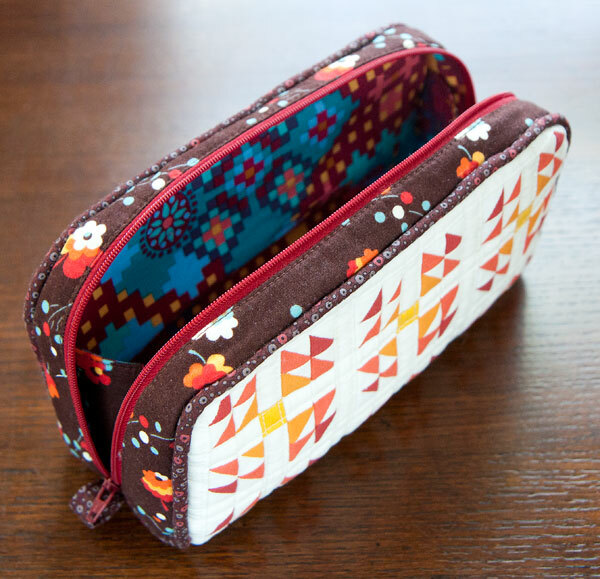 So I’d been admiring the Craft Passion Wide open pencil case for a while, but the thought of doing piping on the outside of a bag around curves was making me hesitate (for good reason, apparently!). I finally decided to just try it and hope for the best! 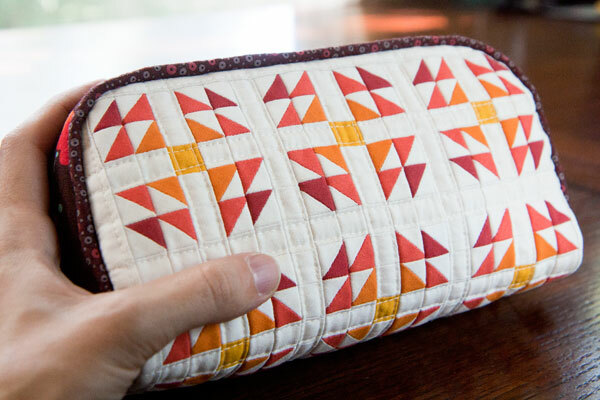 I’d also gotten a fun idea to try adding tiny 1″ HSTs to a Quilter’s grid interfacing panel. I made larger HSTs and then cut out perfect little HSTs using my Sizzix 1″ die. I placed them and some 1″ squares and strips on the Bosal quilter’s grid interfacing and fused them down. I sewed them together the same way that I sewed my watercolor quilt a few years back, using just one panel. I was very curious to see how the accuracy of the points would turn out when piecing it all together this way, and it’s not terrible! Definitely within a reasonable amount of error given the 1/2″ finished squares. I could have done better if I’d made individual HSTs, but then it would have taken me SO much longer… So I think I would call this experiment a success! 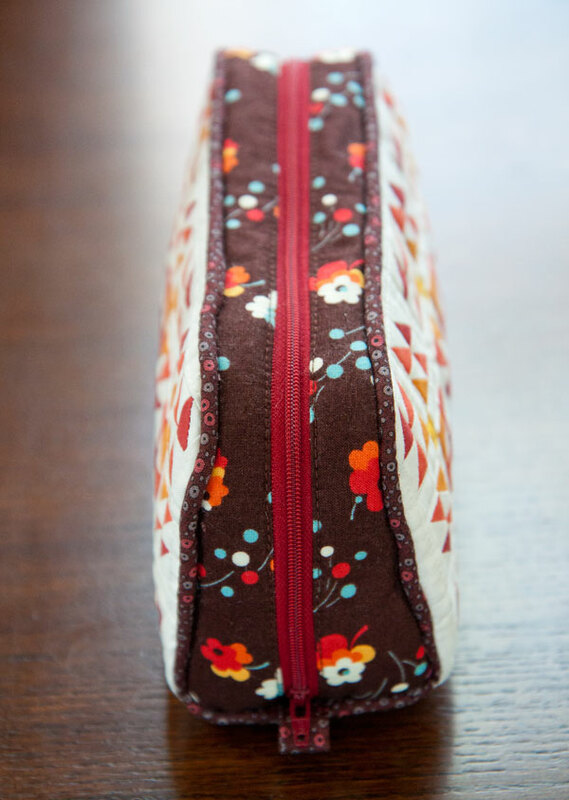 I chose this pretty brown Flea Market Fancy fabric for the outside and inside gusset. I used an Anna Maria Horner print for the lining. The only thing I’m not pleased about with this pouch is the piping. It was the first time I’d done piping with something curved and bulky, and it was really tricky. I think a lot of the problems I had had a lot to do with the bulk and stiffness of the outer panel. 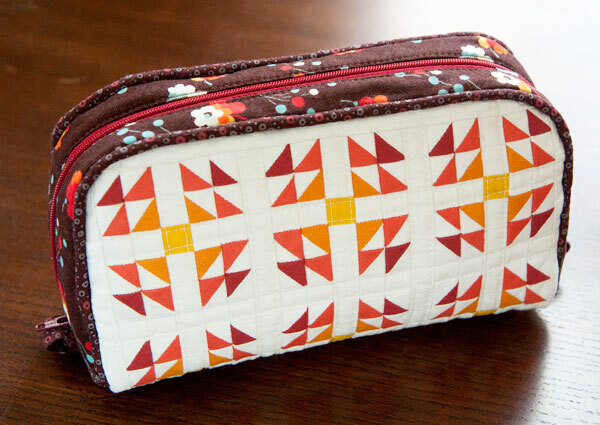 I love everything else about this pouch, so if I were to ever make it again, I think I’d try adding the piping a little differently to see if I could get it more even. 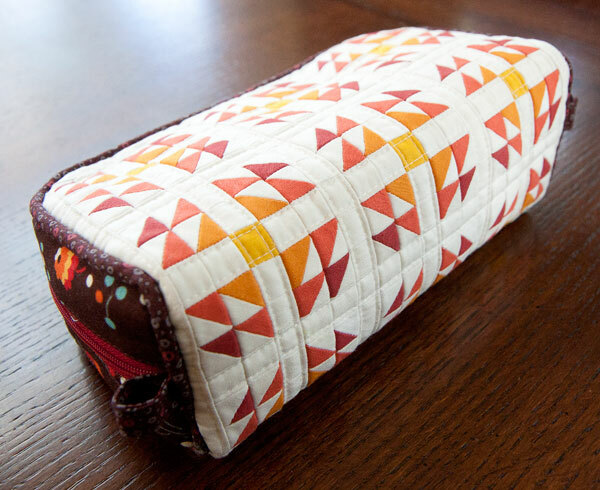 The quilted HST panel wraps around the bottom, so I basically made an entire mini quilt to cover the bag! But it didn’t take nearly as long as you’d think—I’m guessing that even if I count making and cutting out all the HSTs and quilting the outer panel it only took 6 hours to make the panel. When I finished this I was kind of sad to be leaving on my trip because it meant that it would be over a year before I could play with this idea some more. It is definitely high on my list to play a LOT more with this technique. Size: exactly as written in pattern. Those tiny HST are insane!! It’s a beautiful pouch! This is just lovely!!! I love your 52 weeks of zipper project. I am currently doing 52 weeks of hot pads and looking forward to keep up with it. I would love to share the link to your blog with my blog reader this week in my newsletter..
Amira, I love your blog. Thank you for sharing so much of yourself and practical ideas. I’m a beginner and due to health issues can’t really see for more than 30 minutes but you encourage me to try. Be blessed.